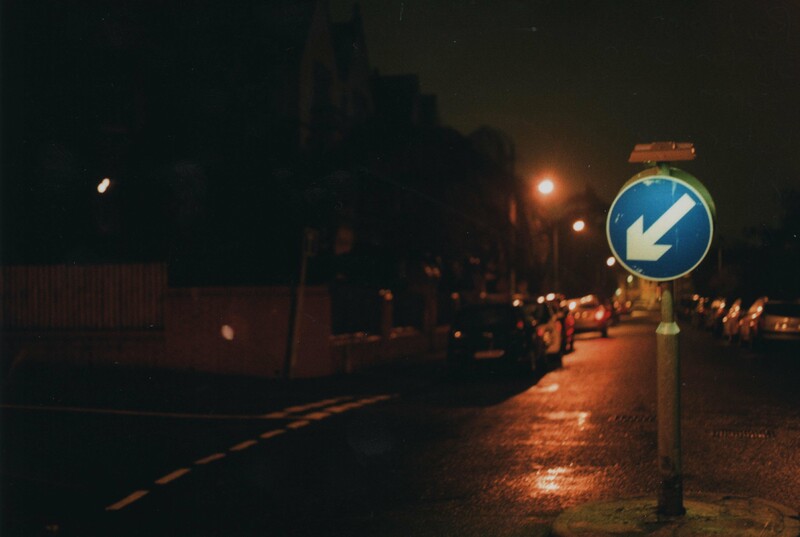 Another one from my Olympus OM-1n with 50mm lens on Kodak Colorplus 200 ISO, this taken at f1.8 1/4 sec. A road sign in the middle of my street outside my house, I really like how much details has been captured here despite it being taken in the middle of the night, the road itself where the lights fall on it can be made out brilliantly and the markings and chipped paint on the sign itself are also visible, albeit due in part to the light from the sign itself helping to make it the prominent feature of the photograph. I also like the road lines crossing the left of the frame and leading to the rows of parked cars that disapear off into wonderful bokeh induced distance. The Rows of streetlights, illuminated like stars in the sky, stretching off I think are good as well.